I’ve received a couple of emails lately from missionary friends of mine who are serving in Cameroon. Dan & Melody Grove have been serving in Africa where they coordinate Bible translation. Much of their work involves created a written alphabet for the first time for some of the rural community people, teaching them the written language and then creating written and video bible stories and translations of books of the Bible to be able to share the good news of Christ with many people who have never heard of God’s love for them. Some of their latest emails have been talking about their rainy season. They share about how mucky the roads are. 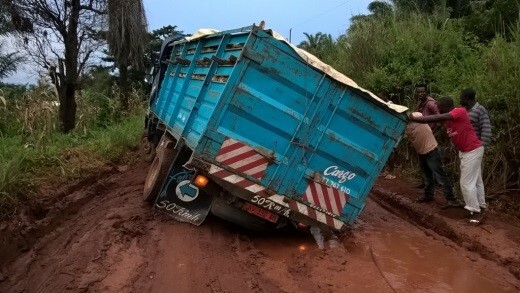 It seems like many of Dan’s days have been interrupted by the need to assist with pushing/pulling big trucks that simply get stuck in the middle of the soft muddy roads. To lighten the load, he often has to begin by offloading all of the cargo that is on the truck and helping to reload it once the vehicle is unstuck. It’s messy work and I suspect that if I asked him, he’s say that it’s not very much fun. What a great example of being a good neighbour! As I reflected a bit on some of the ways that Dan has been helping people in his community, I’m humbled by the reminder that almost every day is pre-planned for me with mailings to send out, phone calls to make, emails to reply to, meetings to attend and events to help coordinate. My weekends often consist of sporting events with my kids, laundry, groceries, etc. I know that many of you can relate. It frequently happens that my day is interrupted by a phone call from someone who needs help, encouragement, advice. Often these are not on my already overwhelming to-do list. One day this week I left my office, at the end of the day, feeling like I hadn’t accomplished much of what I had intended because of all the pressing things that came up throughout the day. I’m reminded by Dan’s example that Jesus did most of his ministry in the community. He didn’t tie himself down behind his desk and reply to emails, make phone calls and coordinate new programs and events. As he went about his business he was continually interrupted by people who needed help, healing and salvation. Jesus always took time for the marginalized in society. He loved the needy. He cared for the widows, poor, sick and the children. I can’t think of anywhere in scripture where Jesus told his disciples to reschedule that needy person because he had to catch up on his emails or make a few phone calls. I think scripture is quite clear that if we really love Jesus with all of our heart than we will be compelled to make time for the interruptions that come into our day. We’ll look for opportunities to serve others, to add value to the lives of people we come in contact with every day. We won’t see these opportunities as interruptions but Jesus moments. I’m a firm believer that Jesus doesn’t need me to accomplish His mission on Earth but what if Jesus is waiting for me to help my neighbour, feed the hungry, care for the sick, or share His good news to a stranger. What if He doesn’t have a back-up plan and by me ignoring those opportunities, while I carry out my busy schedule, no one cares for these people? If my life is all about Jesus and living each day for Him than I’m not honoring my commitment to my work, family and social calendar by ignoring these opportunities; I’m disobeying Jesus command and the opportunities that he is giving to me to grow and develop in my own faith and to bring others into the life giving relationship that he wants for all who are lost. I’m reminded through Dan’s story that serving Jesus can be messy. It won’t always be convenient. It might mean that something else will have to wait. I won’t always feel like the most qualified to help with the given need but I’m thankful that Jesus promises to give me everything that I need (Philippians 4:19). Am I confident that I’ll get it right? Have all the answers? NOPE! Do I think there may be other people who could do it better than me? YUP! I also know that it’s a great honor to be chosen by God to be salt and light in this world. What a privilege it is to be entrusted with the few responsibilities / opportunities that He gives to me and to join Him in his Kingdom work on Earth. When I think about joining God as He changes Atlantic Canada one neighbourhood at a time, I’m pretty sure that I’m being challenged to step up to the plate. Jesus is calling me to increase my level of trust in Him. He’s asking me to get outside my comfort zone. He’s telling me that it’s my turn. I’ve watched others do this all of my life and I admire their wisdom, courage, boldness and faith. I’ve heard amazing stories about churches, youth ministries, families and individuals who have participated in Neighbouring Month. For those who got serious about this, God gave unique opportunities and experiences. God showed up and blessed them as they blessed others. God is calling the Church (people - not institutions - YOU) to step up to the plate. He’s calling us to be good news to our neighbours. Who are the people in your neighbourhood (where you work, study, live and play) that could use a word of encouragement, a meal, a friend, someone just to listen? Where are the community organizations (food banks, soup kitchens, other charity groups) that you could volunteer to help reach some of the marginalized people in your community? Who are the people in your school that seem to spend their day alone? Who are the lonely and shut-in that you could visit? I’m thinking that God says it’s OK for you to start small as long as you start. I think God’s OK if you do it with a friend, family, youth group or your church as long as you are doing something. I also think it’s OK if you don’t get it right the first time. God will continue to give you opportunities to help improve your confidence until you feel like you’re getting it right. Thanks to everyone who posts on social media (#1neighbourhood) about how you are joining God in your neighbourhoods. You are great mentors, encouragers and motivators for the rest of us. Keep up what you’re doing. For all of the rest of us, let’s see what we can do this week – look for opportunities and embrace them. Share your stories with the rest of us. We’re all learning as we go. Let’s make Atlantic Canada a better place for everyone by joining God in changing Atlantic Canada one neighbourhood at a time.